A quick and easy cache on the coast path near Croyde Bay. This cache is a few metres off the path in a fairly accessible area. Will be no problem for kids. No special equipment or skills required. Every year we holiday at Croyde in a lovely cottage near the beach. It has been in the family for years, and the kids always love to go there. 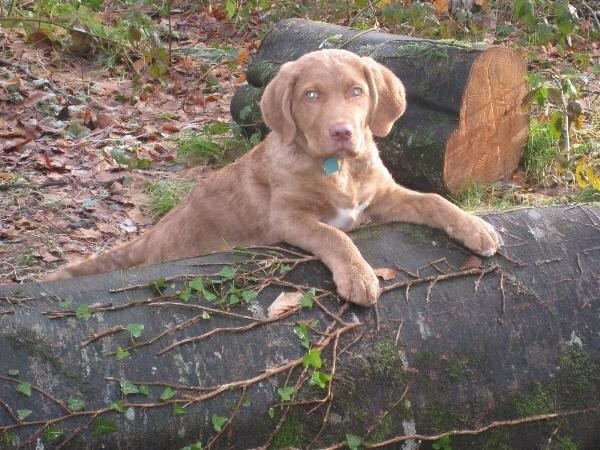 This year, our new dog Chester, the Chesapeake Bay Retriever, came with us for his first holiday here. To commemorate this, we decided to hide a cache near to the cottage. The cache is a small lock'n'lock container which contained when planted several items which have significance to our holidays here. They are: a coin minted from 'gold' panned at Watermouth Castle theme park, near Ilfracombe, a great destination if you have kids under five; a Morrocan coin from the 'Way Down West' series of caches, which are close by and well worth a visit; a 5.56mm calibre shell casing from the military ranges at Braunton Burrows, where the kids love to play in the sand dunes; the Croc travel bug whose mission is to visit beaches around the world, and who we found in a cache at Crow Point; and lastly a dog poo bag, in case any dog-owning cachers are caught without one, as we are fed up with the piles of dog mess that appear outside the cottage! We hope you enjoy the scenery and area as much as we do! Va gehax bs cvar gerr.